My first real food allergy avoidance test was on Thanksgiving. It has become a tradition for about two dozen of us to get together at a friend’s house for dinner, each bringing a side dish (or two) with the hosts supplying the turkey and ham. In our circle of friends, there are so many food allergies, one needs a color coded chart to keep track so there’s no mistakes when having someone over for dinner. I knew I wouldn’t be able to eat everything at the Thanksgiving feast, but I knew I’d have more choices than at a restaurant or even family. 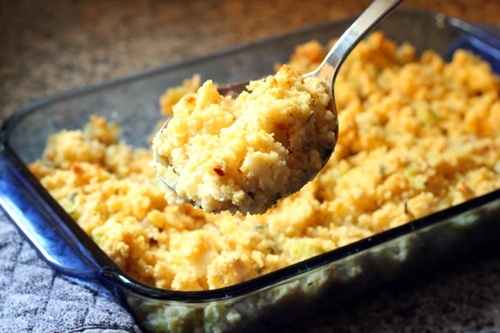 I decided to make cornbread dressing, since it’s gluten-free. Replacing the butter was easy…I just used olive oil. I knew there were some vegetarians attending, so I used vegetable broth instead of chicken broth. Rice milk replaced regular milk. But what could I do to replace the egg in the cornbread? I didn’t have time to run to the store and had no idea what to look for. Searching the web, I found the answer. Using 1 part ground flax seed (which I had on hand) and 3 parts water that I brought to a boil, then simmering for five minutes, I had something with the same snotty consistency of an egg white. Now I had an egg replacement with the added benefit of flax! Below is my entire recipe. Heat oven to 350 degrees. Spray or grease the bottom and sides of cast iron skillet, set aside (You can also use a 9 in round cake pan, but I prefer the cast iron). In large bowl mix together gluten-free flour, cornmeal, baking powder and salt. In separate bowl mix together egg replacer and rice milk. Pour liquid ingredients into dry ingredient mix until the flour is just moistened. Pour batter into prepared pan, using rubber spatula to scrape batter from bowl. Spread batter evenly in pan, smoothing top of batter. Bake for 20 to 25 minutes or until golden brown and a knife inserted in the center comes out clean. Cut cooked and cooled cornbread into ¼ inch squares. Preheat oven to 350 degrees. Grease 9×13 casserole dish. In large skillet over medium heat, sauté the celery, onion and bell pepper until soft. In large bowl, combine all ingredients, starting with only 1 c stock and mixing well. Add more stock as needed. Place into prepared dish and bake for approximately 30 minutes.